We’ve got a new Brand Ambassador! Truthfully, there is simply no one better. With Rodelle I know that I have repeatable quality with a level of expected excellence each and every time. It is all that I use professionally and personally and the only brand I recommend to my readers. As both an engineer and a chef I’m extremely critical of what I use and what I put my name/brand behind. Rodelle simply is THE BEST! I would love nothing more than to be a Brand Ambassador. I am brand loyal which, for my millions of readers, resonates loudly. I’ve been blessed to gain their trust so for me to say how much I love a brand speaks volumes. Simply put, I love your products and be honored to team up with you! Brand loyalty means a lot these days, and we are flattered that Lori picked Rodelle to share with her readers! We’re excited to one of Lori’s latest recipes that really showcases her comfort with Rodelle’s products, her culinary skills and her commitment to testing recipes and giving her readers the information they need to make the recipes with success! 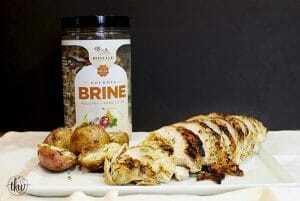 Lori used Rodelle’s Gourmet Brine to improve 2 split, bone-in chicken breasts. She brined the chicken breasts and then cooked them up in her Instapot – talk about 2 tools that do the work for you…Brining your meat is a relatively easy and hands-off process. Prepare the brine like Lori suggests, and then your meat just does the brine bath in the fridge while you go about your day. Check out how Lori goes from brine to the best chicken you’ll ever eat in her post! And, be sure to check out Lori’s site frequently for more yummy recipes (savory & sweet) that showcase a Rodelle product (or two). We have a heads up that there will be an irresistible cookie post coming your way soon! !